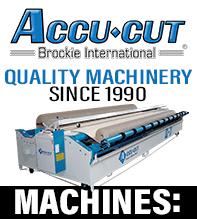 Since 1990, we at Brockie International / Accu-Cut have been providing our customers with the best quality cutting and rolling machines that can be produced. We have been able to dramatically increase the number of new customers each year while maintaining the company's long established working relationship with the many thousands of existing customers. Our company's mission is to continue to provide quality, state of the art equipment to our customers while also ensuring that we can give them the back up service and support that we would expect ourselves. We are constantly improving our service and the features on our equipment so that we will have a customer that is proud of their machine and the relationship they have with us. We have partnered with the industries top software companies to integrate your floor covering software with your Accu-Cut machine. This enables you to electronically send your cuts from your PC directly over to your Accu-Cut machine. The advantages and benefits of this new technology are overwhelming. For example, you can automatically update your inventory, print and scan your roll tags, generate inventory reports and eliminate the risks of cutting the wrong material and sizes. This combined with many of our other industry leading advantages, shows Brockie International has proven to be the global leader in floor covering cutting and rolling automation. We are pioneering the development of synthetic turf cutting and rolling machines models and successfully placing them around the world. We take pride in working with the industries top floor covering buying groups, home centers, and floor covering professionals. Whether you are a single store operator or a major retailer it is our goal to ensure that you receive the best products and services we have to offer. We encourage you to put us to the test. We would be glad to give you the names of some of our customers in your area to tell you first hand about their Accu-Cut equipment and our company.